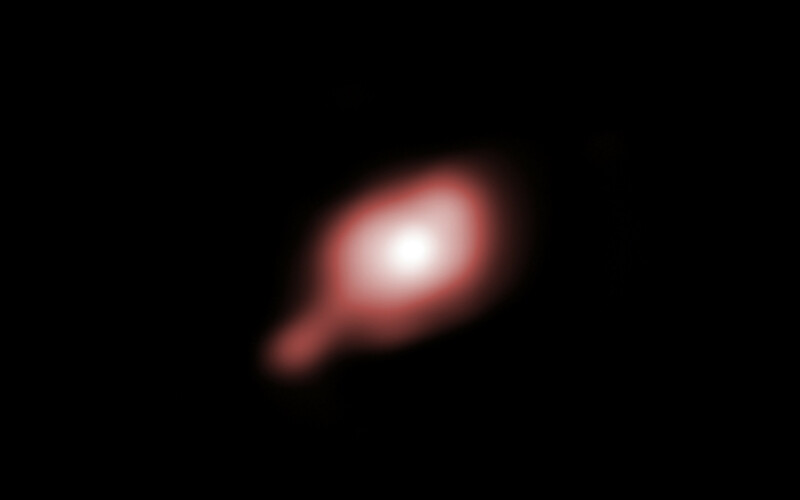 Astronomers have been able to obtain the first image of a dusty disc closely encircling a massive baby star, providing direct evidence that massive stars do form in the same way as their smaller brethren —and closing an enduring debate.In order to discover and understand the properties of this disc, the astronomers employed ESO’s Very Large Telescope Interferometer (VLTI). By combining the light from three of the VLTI’s 1.8-metre Auxiliary Telescopes with the AMBER instrument, this facility allows astronomers to see details equivalent to those a telescope with a mirror of 85 metres in diameter would see. The resulting resolution is about 2.4 milliarcseconds, which is equivalent to picking out the head of a screw on the International Space Station.